Till that bloody day in Paris when 12 brave hearts were butchered for standing up for free speech, the name a�?Charliea�� meant so many things to so many people. In the shadowy streets of London, it was the code word for cocaine. Among giggly Victorian women a�?Charliea��s deada�� was the euphemism for a�?your slip is showinga��. For men high on testosterone, a�?Charliesa�� meant a pair of hooters. The Oxford English Dictionary refers to a�?Charliea�� as the Brit slang for a a�?fool or simpletona��. But January 7 changed everything. Out of the blue, the rallying cry Je suis Charlie (French for a�?I am Charliea��) emerged as the collective middle finger equivalent for everyone opposed to intimidation of freedom of expression. 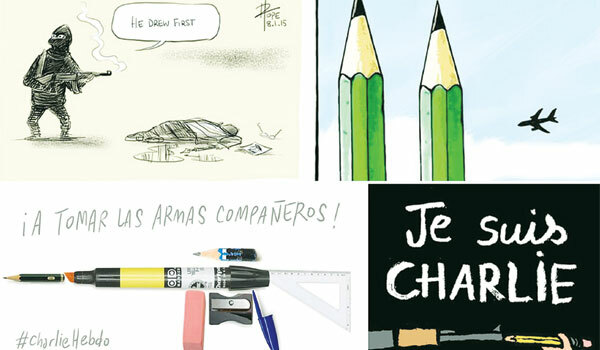 The Charlie Hebdo attack made us all pause for a minute. And ponder weighty issues like: a�?What the hell does Hebdo mean?a�� If you thought along those trivial lines, youa��re not alone, my friend! To clarify matters, Hebdo is derived from hebdomadaire, the French word for a�?weeklya��. So Charlie Hebdo essentially means a�?Charlie Weeklya��. Originally known as Hara-kiri Hebdo, the satirical newspaper took its name from another comic magazine titled Charlie Mensuel, which in turn borrowed its Charlie from Charlie Brown, the Peanuts character. The urban legend is that a�?Charliea�� was picked because it was an inside joke on Charles de Gaulle, the then French President. Leta��s dissect the pedigree of a�?Charliea�� further. The diminutive of a�?Charlesa��, it literally implies a�?free mana��. Given what transpired in Paris, very unsurprising, no? Charlie has been the famous first name for scores of distinguished men. Charlie Chaplin, the comedian extraordinaire, was actually christened after his dad. Charlie Sheen was different though. He was born Carlos Irwin Estevez. a�?Charleya�� was also the screenname of Tamil actor Manohar Velmurugan Thangasamy. Incidentally, like Rajnikanth, he owes it to the late K Balachander. Contrary to common belief, the comic character Charlie Brown is not a nod to its creator Charles Schulz. By his own admission, it was a tribute to his friend from art school days. Then therea��s the saxophonist Charlie a�?Birda�� Parker who owed his middle name to his childhood habit of being a a�?Yardbirda�� or someone who hung out in the yard outside clubs listening to the bands playing jazz inside. There are many more Charlies worth talking about. But for now, leta��s raise a toast to the one who redefined them all with their pungent wit. Got a Charlie that I missed? Pitch in by writing to anantha@albertdali.com.